A big, new out-of-town supermarket for Ludlow? More to come? 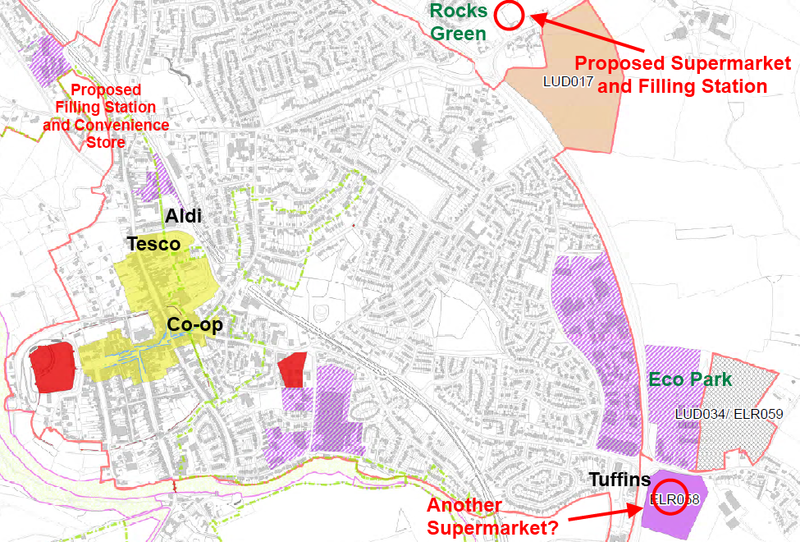 A big, new supermarket for Ludlow could be in the offing, if plans presented to the town council tonight go ahead. Retail consultant Simon Hoare tonight told the town council’s representational committee that his client, Blackfriars Property Group, is looking to develop a site adjacent to Rock’s Green, behind Dun Cow Cottage. The proposal is for a 26,000 square foot supermarket and a filling station. [Ludlow Tesco is 20,000 sq ft.] The store will sell 75% convenience products, food and daily essentials, and 25% comparison goods, things like electrical goods and clothing. Hoare said that the proposal passed the “sequential test”, which insists that supermarkets are built in town centres unless there are no sites available. He said there are no suitable sites in Ludlow centre. Tesco and Aldi, he claimed, are “over-trading”. That’s retail jargon for saying that opening another store wouldn’t cause existing supermarkets to go under. There is also “leakage” to Leominster, Shrewsbury and Kidderminster. That’s jargon for saying that people from Ludlow sometimes go to shop elsewhere. As yet, the supermarket chain that will run the site is unidentified. The consultant said the site will create 250 jobs, a third of which will be full-time. The consultants have not yet conducted the legally required assessment that any such scheme would have on the town centre. A survey of residents had been completed. The developers are likely to consult with residents of Ludlow early to mid-July, with the aim of submitting a planning application at the end of July. Planning permission is already being sought for a filling station, coffee shop and 4,500 sq ft convenience store on Bromfield Road. There are also persistent rumours that there will be a renewed bid for a supermarket south of the Eco Park, on the other side of the road from Harry Tuffins. The Rocks Green proposal may not be the only out of town supermarket bid the town has to deal with.